The multiuse path crossing over the I-29 bridge is open for use to connect bicycles and walking paths in the area. Pedestrians using this busy stretch of roadway have the opportunity to again cross safely by using the protected underpasses located at each of the interstate ramps and fenced walkway over the bridge. The northwest I-29 ramp underpass is the new addition to the multiuse path. The project’s goal was to maximize the initial investment of the roadway and bridge and perform a variety of approaches, including preventative maintenance, widen existing infrastructure, or replacing aging infrastructure, to improve safety and benefit businesses with better access for drivers and pedestrians through the South Fargo corridor. 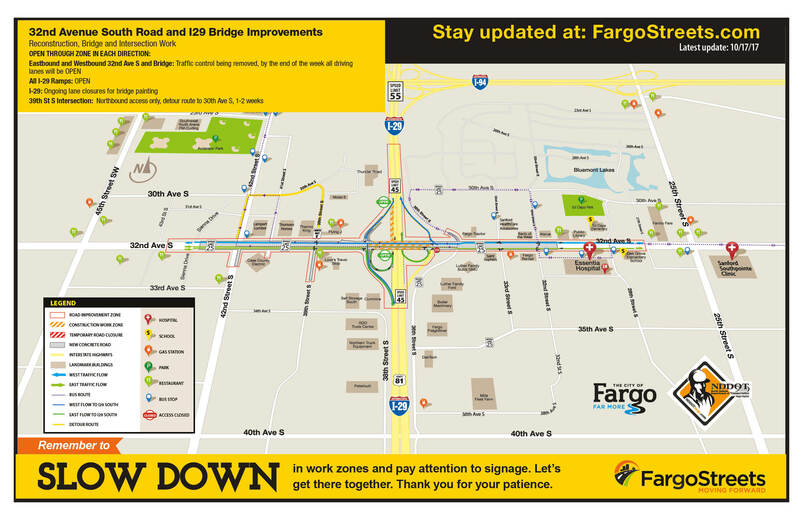 Aside from removing traffic control devices from the roadway, crews will be doing miscellaneous finishing work and painting underneath the I-29 bridge throughout the rest of the week. Starting Thursday, October 19, final project work will continue off the main-line of 32nd Avenue S. The intersection of 39th Street S and 32nd Avenue S will have a short-term closure to southbound traffic for the next two weeks. Motorists will be able to continue to travel northbound. Crews will be working on half of the roadway at a time to complete the needed finishing work. Traffic wishing to return to 32nd Avenue S from 39th Street S will use the posted detour of 30th Avenue S to 42nd Street S.
In the coming weeks, MATBUS routes in the area will shift back to original routes, and riders are asked to visit MATBUS.com to view updated routes. 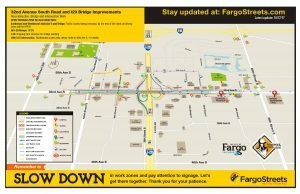 The City of Fargo and NDDOT Fargo District construction cost is $19.6 million, and work started in mid-March. The contractors for the project reconstructed and widened 32nd Avenue S and I-29 bridge to a six-lane roadway to accommodate increasing traffic volumes, improved the driving surface of the I-29 bridge deck with an new overlay, add a new southbound I-29 eastbound loop ramp in the southwest quadrant of the bridge interchange, update and repaired utilities, street and traffic signals and increase to availability of shared-use paths through the area. The 32nd Avenue S and I-29 area remains an active work zone for the next few weeks, please remember to eliminate distractions and obey posted speed limits as lanes begin to open up and crews are moving through the work zone.